Water toys and great catering are essential components to all great charters. Take a look at the options available to you, and be sure to make them a part of your request. See our sample itineraries of different charters ranging from a half day and up to a week or create your own customized charter based on your preferences. Take a look at some of the great videos of our valued guest havening a wonderful time. We look forward to being a part of your own special and one of a kind event. Welcome to Pacific Northwest Yacht Charters and our website where we hope you will find all of the relevant information necessary in support of making a well informed and educated decision when BOOKING A CHARTER and perhaps a vacation with us. There are varying lengths and types of yachts so choosing one that best matches your needs and interest is critical. If you are just celebrating a special EVENT OR OCCASION for the day or looking to island hop for a week, our staff and captains are well experienced in the waters of the Pacific Northwest and Seattle. Once matching your particular needs and time of charter to a specific vessel, booking the vessel time is relatively simple. The cost for each Luxury yacht varies with the size and the duration of your charter, and so these are all things to consider when moving forward with us or whomever else you might choose. The one consistency is our 5-Star service and our best price together combined to give you an unbeatable value. The types of yachts vary as do your interest, and so it is the goal of Pacific Northwest Charters to align you with what suits you best. Yacht sizes start at around 35’ and go up to well over 100’ to Mega Yacht status. Many yachts are built to suit one main common interest such as sailing, fishing or power while most luxury yachts have an emphasis on luxury with a capability of scuba, fishing, and virtually any occasion. As the yachts size increases, so does the amount of crew to maintain and navigate. Vessels such as catamarans are typically wider which allows for more people when matching up against the length of a normal luxury yacht. However, most catamarans are primarily for sailing which limits the amount of speed that can be produced, but recently many Luxury Catamarans are customized with added power. The one commonality with all yachts from Pacific Northwest Charters is they are all luxurious and beautiful exceeding what would be the Gold Standard in yachts, and we pride ourselves on providing the absolute best value for our service. 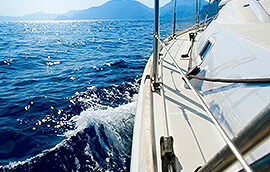 To find out more about our FLEET OF YACHTS Click Here. Whether you are looking for a vessel for a group outing, a corporate event, wedding, proposal, friendship gathering, New Years Eve Party, birthday party, holiday event, anniversary, retirement or a one week island trip to Victoria, Vancouver, Desolation Sound, San Juan Islands, Whidbey and or a variety of destination and occasion choices, we have a beautiful luxury vessel for you. In addition, we have a wide selection of water toys and fishing craft that can be secured in conjunction with your yacht charter. In the event we do not have a requested item, we will do our best to find it and get it for your big day our outing. We also work with various DJ’s, musicians, wedding planners, caterers, etc… and so please inquire if we can be of any assistance. As you can see, we at Pacific Northwest Yacht Charters support a wide variety of events and occasions, and we enjoy assisting you in the planning and implementation of your big event. Our team has decades of experience in the waters of the Pacific Northwest, and we love to exceed your expectations on each and every outing. To find out more about our EVENTS AND OCCASIONS Click Here. Booking a charter is relatively simple. At least we try to keep it that way. When working with our staff member via telephone or email, they will line you up with the best possible luxury vessel for the best possible value. Once you are in agreement, our team will send you a paypal request for a deposit. The request will outline all of the different details of your trip or event. Once the deposit is paid, the vessel is held for your important event duration. Depending on your specific requirements, the remainder is usually due at the time of your charter unless there are special requirements which may require the remainder of the due amount several days before the charter. The cost of each vessel varies, and is dependent on the size and use of the yacht you will be chartering. As the yacht grows longer, so does the crew requirement. Accordingly, as the list of requirements for your excursion grows, the price increases as well. It is our goal to always keep the price as low as possible, and all prices are disclosed in advance. More importantly, our level of service and customer care strategy never change, and our goal is to always exceed your expectations for the best possible price.